"Silver Star is still a relatively well kept secret and so you'll have the slopes pretty much to yourself, definitely worth the extra short flight from Vancouver. 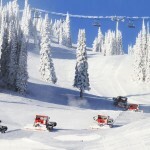 There's some great lodging and everything has been made so easy for guests - especially families"
Silver Star is British Columbia’s 3rd largest ski area with over 3000+ acres of incredibly varied terrain, from the gentle to the formidable, all featuring beautiful dry Okanagan powder and impeccably groomed runs. With four separate mountain faces and 132 trails, Silver Star is an uncrowded resort celebrating its 60th anniversary as a perfect environment for learning and progressing. If you want the intimacy of a colourful, ski-in/ski-out, mid-mountain village offering quality accommodation with skiing that will please groups of mixed abilities or families, this is one of your very best options. Silver Star has two distinct areas - Vance Creek on the front side of the mountain, and Putnam Creek on the backside. Both areas are very different in character but combine together to make Silver Star a destination that feels way bigger than the sum of its parts. NEW for winter 2018-19 (opening July 2018) is Silver Star’s new 8 person village gondola whisking skiers and riders from the village to the summit in around 4.5 minutes. One of the very best features about Silver Star is the progression of the terrain for learners – you start right in the village with your own learn to ski or ride zone. After that you can jump on the new gondola to the summit straight from the village or slide gently down to the Comet Express and ascend to the summit. Once you’re on top, drink in the 360 degree view before cruising down the front side of Vance Creek – you really are spoilt for choice here in terms of quantity of trails and quality of terrain. There’s a massive choice of easy greens and gentle undulating blue trails here. Next you move a bit further afield and try the excellent glades down off the Silver Woods Express – ‘Baker’s Acres’ and ‘Trinity Trees’ are super fun. Then you’re ready for some fast cruising down the beautifully groomed blue trails off the front face of Vance Creek, before moving over to Attridge peak for a few short sharp intakes of breath down the tighter more technical drops off the Alpine Meadows Chair. For intermediates, Silver Star’s Vance Creek area is exceptional with superbly crafted terrain all accessed easily from the village. Now it’s time to move to the dark side…over on Putnam Creek, despite one long green run - the feel of the terrain changes quite dramatically. Here we're talking double black diamond, steep, fast, downhill on well-maintained trails, or vast bumps, squeezed into narrow couloirs that await the faint of heart – here you’ll find expert and gnarly terrain in spades. This is an enormous area of around 1900 acres in its own right which the trail map fails to do justice. Advanced skiers and riders will be in hog heaven here. There are also some blue trails on Putnam Creek - so it is entirely possible for groups with very different ideas of what a 'good' run is to ski together taking different routes and meeting for the chair-ride back to the top for some repeat action. Finish the day with a lazy slide down Last Chance before heading for a well-earned après beer at the Den Bar & Bistro or mingle with the locals in Long John’s Pub. All of our featured accommodation is right in the village, making access to all of Silver Star’s bars, shops and restaurants super-easy. If you still haven’t had your ski fix for the day, then Silver Star offers night skiing on most Fridays and Saturdays. All of our holidays to Silver Star include a short 60 minute shared shuttle transfer from Kelowna airport. We can also offer a selection of bespoke private transfers.